I was fortunate to see the band twice in the space of a week. 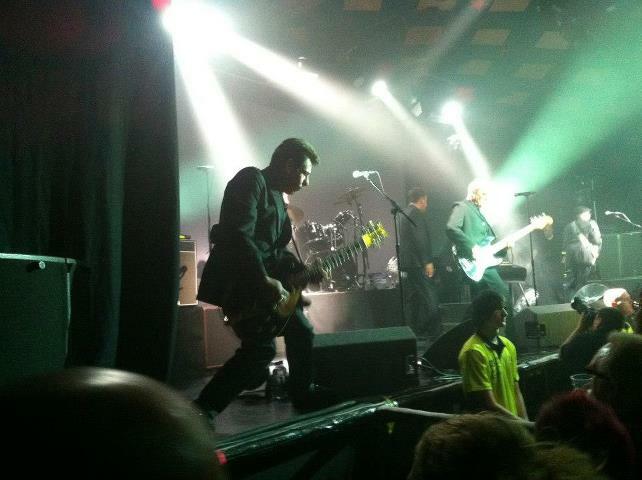 Last Sunday I was invited to see them open for Del Amitri at the Barrowlands. This wasn’t the first time the Trashcans had played here. A short 28 years ago they provided support for Prefab Sprout, a gig most memorable for Frank doing an Iggy on the PA system before we (myself, my pals and select Trashcans) hot-footed it back to Irvine for a night in The Attic. To my regret I didn’t even stay for Prefab Sprout, but when you’re young and daft and your popstar pals want to share tour stories and dance to their own records in their hometown, that’s what you do. 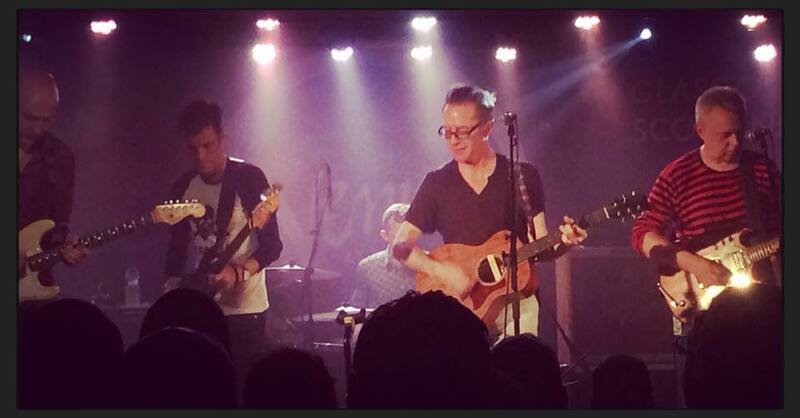 For the Dels shows, the Trashcans built a 45 minute set of their greatest shoulda been and coulda been hits; Got Carried Away, All The Dark Horses, Hayfever, Obscurity Knocks. How Can I Apply, Easy Read….it’s an endless list, really. They sounded fantastic. There’s a rich chemistry between them, honed on their recent three-piece zig-zag across America that transfers easily to the six-piece they are at the moment. The playing is spot on and the singing is sublime. Frank’s voice is richer than it ever was. Listen to Cake and at times he sounds almost helium-enhanced by comparison. These days, he’s an effortless crooner, using the dynamics of the microphone to great effect. He’ll step away from it to holler. He’ll lean in to it to whisper. He’ll spit and snarl when he has to then sooth your ears when he wants to. Make no mistake, he’s a soul singer, is our Frank. 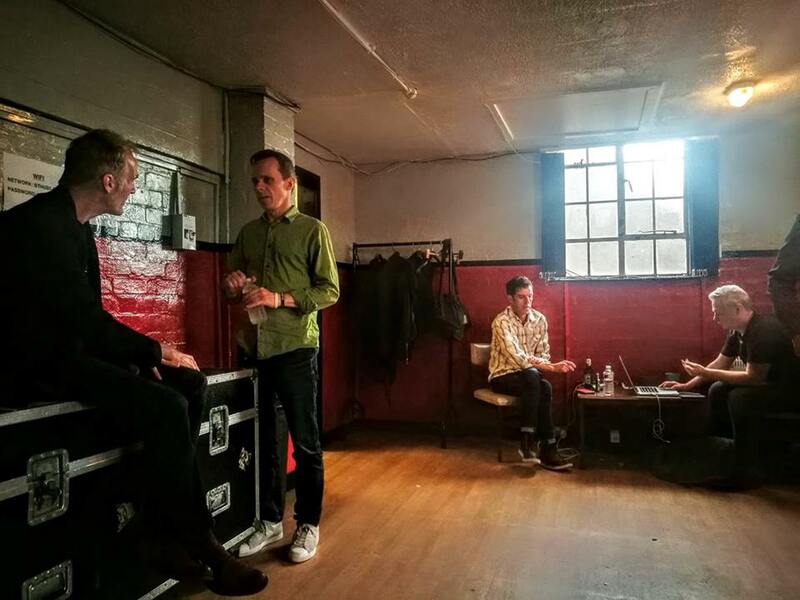 At the Barrowlands the band looked nervous. Most eyes never left the frets and audience participation was sporadic and rehearsed rather than free-flowing and spontaneous. Perhaps it was the not-so-subconscious realisiation of playing in front of home fans that brought about a mild case of the stage frights, I dunno, but the band remained rooted to the spot, with no chance of any Iggyisms at all. It’s not a criticism, it’s just the way I saw it. Perhaps I’m comparing them to Del Amitri, an act who were slicker then the Fonz’s quiff. Bang! Bang! Bang! came the hits, each song starting before the last one had truly fizzed out. The Trashcans shambled on, played a song, looked a wee bit apologetic about it and with a shrug of the shoulders dragged themsleves into the next one. The Ramones could’ve played side 1 of Rocket to Russia in the gaps between the songs. They sounded great ‘n all, and while the Trashcans have never been the slickest of bands – that’s half the appeal, after all – a wee bit of oil in the engine wouldn’t have done any harm. For me, the highlight of the night was realising a lifetime’s ambition by securing a Barrowlands AAA pass for all of 20 minutes. The dressing room was just as I’d imagined…. The Kosmo Vinyl of the TCS, Big Iainy talks Bowie with Stephen. Davy and John ponder the lack of brown M&Ms. That Barrowlands show was the Trashcans’ last on the Del Amitri tour, following which the semi-skimmed 3-piece version of the band skipped across to Dublin for an acoustic show before returning to home turf for a trumphant, full fat, headline appearance on the Thursday night. Anticipation was ridiculously high for this one. Rave reviews of their support slot gigs were ubiquitous across all social media platforms. The word was the Trashcans would play a blinder. And so it (eventually) proved to be. The venue was rammed. A total sell-out, and with it being a local affair and what not, I suspect the guest list was rather longer than normal, so by the time Michael Marra’s Hermless had ushered the Trashcans on to the homely stage, we were standing sweaty shoulder to shoulder with friends and strangers in a venue designed for far less people. Most bands like to make a statement of intent with their opening number, a Maiden-type ‘we’re here and we’re in your face’ sonic assault. The Trashcans roll out Got Carried Away and from the off, something isn’t quite right. You can see them looking at one another, checking capo positions as they strive to switch into gear. Someone is apparently very badly out of tune. The song stumbles to a stop and everyone fiddles with guitars, capos, pedal tuners and so on until the culprit is outed as John. He fiddles with the tuners on his guitar. Stomps on his pedal tuner. Fiddles again. “Sorry ’bout this,” he offers meekly. “Gimme an E, Paul.” There’s a joke to be had in there, but despite the heckles and good-natured banter, no-one thinks of it quickly enough. 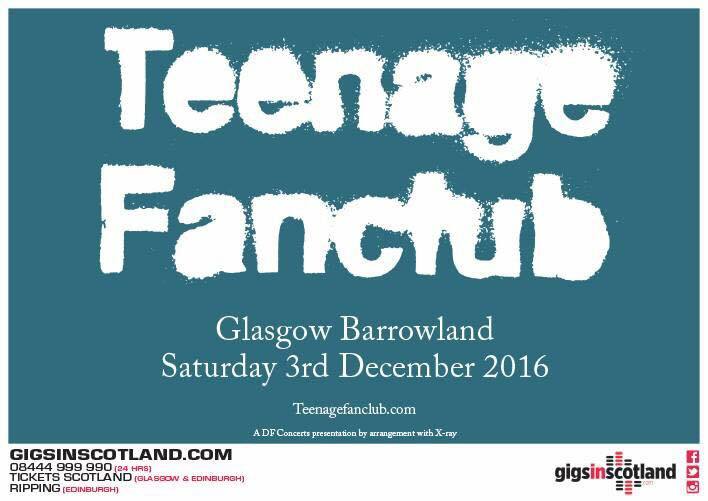 Those gaps in the Barrowlands set now seem miniscule. Indeed, yer Ramones could’ve played an entire show in the time it took to put the tuning gremlins to bed. Once they’re off, though, the Trashcans proceed to bring the house down. On record, Got Carried Away is enhanced by Norman Blake’s warm harmonies. Live, the Douglas brothers provide a great alternative. It’s a terrific opener, all mid-paced chiming melancholy and gently tumbling toms. “Hey, it doesn’t matter,” it goes. Frank croons. Girls swoon. And the world is alright. The songs that follow are pretty much the ones that warmed up the Del Amitri audiences. The uplifting All The Dark Horses (played half a key lower, trainspotters), a fluid How Can I Apply, a wonderful Freetime that’s carried along on a melody an early 70’s Brian Wilson would’ve been proud of and a frantically scrubbed run-through of Obscurity Knocks, the chorus spat with a furious venom. All in all, a pretty great opening. Things then got interesting as the band dug deep into their endlessly rich back catalogue. Songs last heard when Scotland could be bothered to qualify for World Cups popped up, totally unexpected and gratefully received; The Genius I Was, Thruppeny Tears, Bloodrush, Only Tongue Can Tell, January’s Little Joke. All were played with reverance and wide-eyed wonder at the love they received. By now condensation was running down the walls. The band were wilting, melting. All the band that is, with the exception of Davy Hughes. The bass player has always been the coolest Trashcan and standing there stoically against the elements he looked like Mount Rushmore, a faced carved from the offspring of Mick Jones and Keith Richards. “Y’know that way when it’s so hot your trousers start to slip down?” he told me later on…. On this form, the Trashcans would be advised to get straight back on the road and bowl ’em over from Land’s End to John O’Groats and everywhere in-between. The likely reality though is that Frank and Paul will return to their homes in the States and it’ll be a good couple of years before we see them once more, which, again, is frustratingly half the appeal. Here’s the slightly hippy, slightly trippy The Genius I Was, for no reason other than it’s a cracker. And here’s a terrific version of A Coda from an anonymous US Radio session. Years ago at the TCS merch stall I recommended Billy Sloan play it on his Radio Scotland show that weekend and he did. Alternative Version, demo, Live!, New! Now! At the end of my back garden there’s a fence. Down a steep slope behind the fence is the Ayr-Glasgow railway line. It’s a busy line, but you get used to the trains going past every 15 minutes. In fact, you rarely hear a train. And when you do, you could set your watch by it. Scotrail. They’re getting there, or to Ayr and Glasgow at least, on time. Now and again the silence is punctuated by the Hunterston coal train. The power station up the road needs regular feeding by coal and occasionally the train will be held up at the points while another commuter train snakes its way out of the suburbs and on into Glasgow. The Hunterston train doesn’t stop very easily. Weighed down by 35 coal-carrying containers, it starts braking 4 miles up the line in Dalry. By the time it reaches Kilwinning, and my back door, it’s making a cacophony of noise; grinding steel on steel punctuated by the odd hellish rumble, but mainly a horrible metallic screech that jars the nerve endings and sends cats and dogs running for cover. 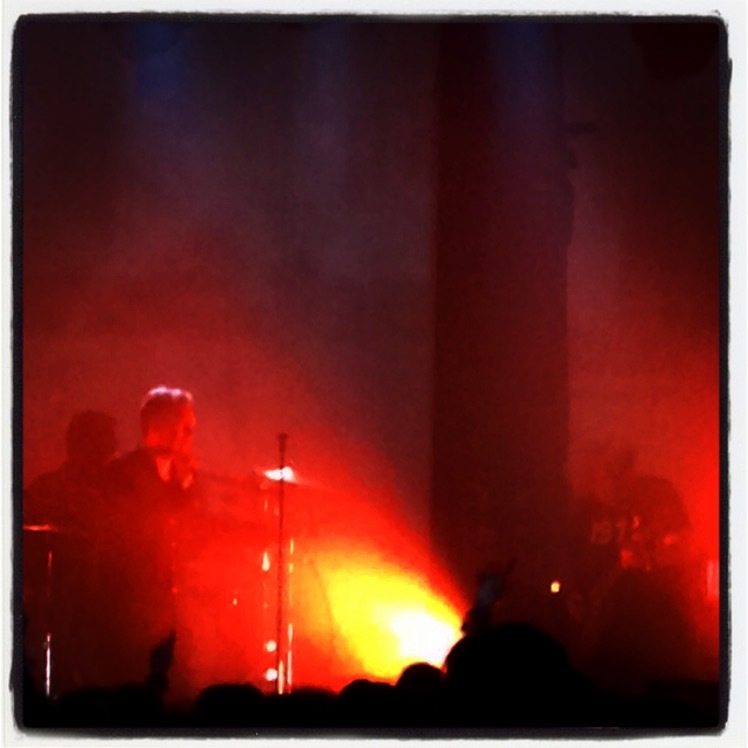 Around 9.30pm last night, it struck me that this is the wonderful sound of The Jesus And Mary Chain. 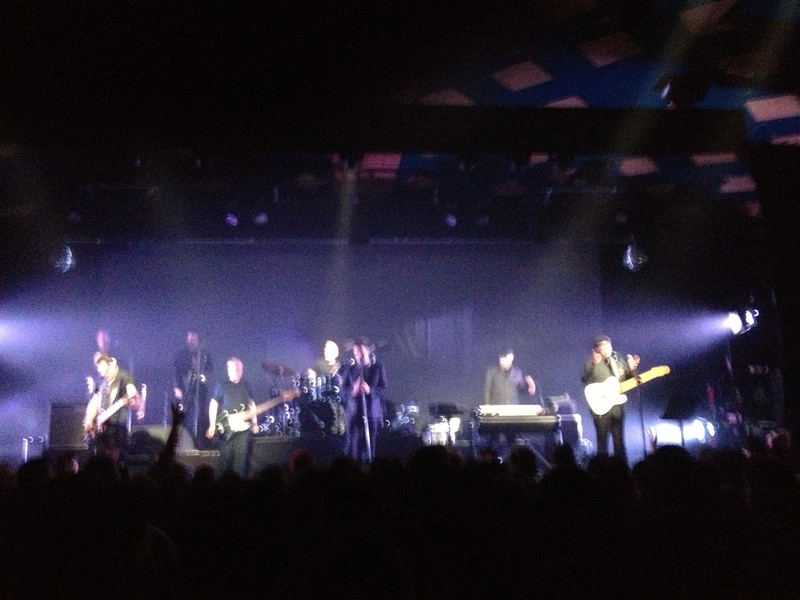 They were back on (almost) home turf over the weekend, pitched up at the Barrowlands to play the Psychocandy LP, track-by-track. It’s an album that rarely left my turntable when I was in my late teens, but not, I must admit, an album that has stayed with me in the way that other ‘Classic’ albums (insert your own here____________) have. Nonetheless, to hear it in its entirety was too good an opportunity to miss for myself and a couple of thousand other folk of a certain age. The band began the show not with Just Like Honey and the rest of the album falling after, but with the encore. “We’re contrary fuckers,” explained Jim Reid. So as an aperitif we got April Skies, Head On, a twangin’ prime Velvets take on Some Candy Talking and a couple of tracks that I struggled to recognise on account of the vocals being buried so deep in the mix they were practically being sung from Australia. At times William’s guitar was so out of tune he was practically playing jazz. Free, experimental jazz, and he knew it. I lost count of the number of times he attempted to tune up between songs. “Stop!” shouted his brother at one point, sounding uncannily like one of those early JAMC bootlegs I had from the days before they knew how to end songs, and the band came to a juddering halt, just like that train at the bottom of my garden. Recovering in time though, best of all was a head-splitting version of Reverence, replete with descending, fuzzed-up I Wanna Be Your Dog guitar riffs that went straight into a white-hot version of Upside Down. Top that, you’re thinking. And they did. Taking no prisoners, they rattled through Psychocandy. Guitars sounded like sirens of war, or like a hundred bottles being smashed against a greenhouse wall in the middle of a violent storm. They felt like tiny hand grenades of pain on the ears. This was a full-on sonic assault and battery on the senses. Backlit by white light and strobes, at times I almost zoned out as the band, stock still in silhouette, never let up. Fast-cut film of motorbikes and 60s girls and staring eyes and melting things and swirling patterns and kaleidoscopic psychedelia played relentlessly. It was the Exploding Plastic Inevitable turned up to 11. Scratch that, it was turned up to 14 or 15. It was uncomfortably loud, perhaps just as the band intended it to be, but as I type there’s still a background screeeee to everything I hear. It goes without saying of course that if you get the chance of a ticket when it comes to your town, make sure you grab it. Pop music, pure and simple. 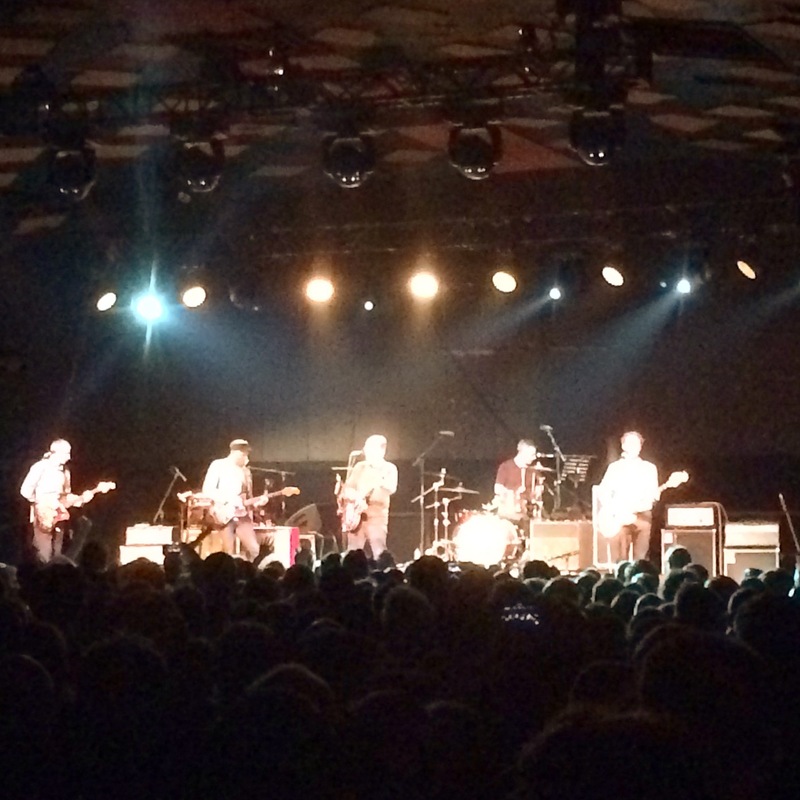 Paul Weller at the Barrowlands on Monday night was terrific. The opening night of his ‘One Night Only‘ tour, this was Weller’s way of gathering up the best bits of his back catalogue and playing them with a renewed effervescence and vigour that could shame a band with a combined age less than half his 55 or so years. Not that we knew it at the start. 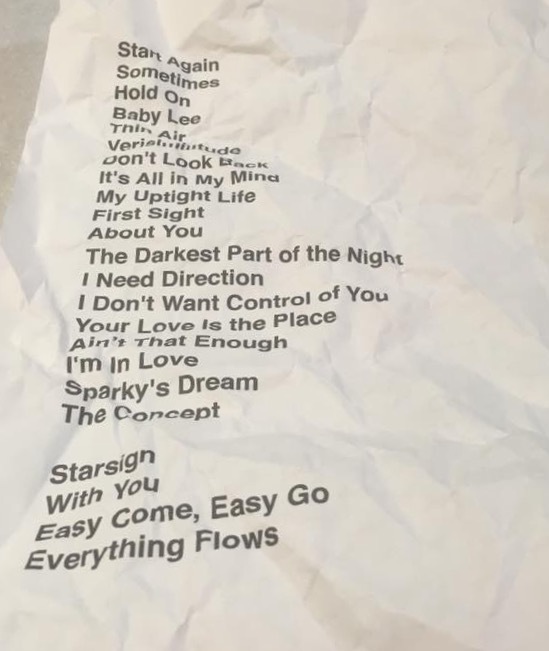 A Paul Weller gig without an album to promote always puts the needle into the red on the old apprehensionometer – this might’ve meant a set of brand new material to endure, with a couple of greatest hits flung in at select moments to appease a restless crowd. Not a bad night out maybe, but not really what you want on a Monday night. From the off, though, when a free from fanfare and flashing lights Weller strolled on at the unfashionably early time of 8.30pm, all perma-tan and tight, tight trousers, and fired into Sunflower, it was clear he was here to entertain. Earlier on, the DJ had played a not entirely inspired selection of 60s and 70s 45s. You won’t need me to list them for you. Stuck somewhere in the middle was Bowie’s Golden Years – a wee clue to how the night would proceed. Not for PW a cosy pipe ‘n slippers run through of his earlier past triumphs, this was going to be a back catalogue cherry pick through his own golden years, played for us like the Angry Young Man from Woking he once was. The set was given a modernist (no pun intended) twist thanks to the liberal sprinklings of sonic stereo swooshes and panning vocal effects that were in equal parts druggy and dubby, but especially due to the use of a piercing Telecaster for half the songs. This gave the band an angular, angry, post-punk sound; aggressive yet arty, taut yet trippy. Third song in was From The Floorboards Up, and even more so than the recorded version, it was total Wilko Johnson. From the opening slashed chords onwards, Weller channeled his inner Dr Feelgood. Not many would’ve noticed, but for this track PW ditched the plectrum (just like Wilko!) strummed with open hand (just like Wilko!) and perfected that thousand yard stare (just like Wilko!) Between a couple of verses he even had the nerve to do that spasmic, wired-to-the-mains electrified stagger across the stage – aye, just like Wilko! Tonight Matthew, for the next three minutes, I’m going to be Wilko Johnson. And he was. Never before have I seen such an obvious ‘we’re not worthy’ episode of hero worship. Did anyone else spot it? The set thereon in was inspired. The Style Council’s My Ever Changing Moods was a surprise early addition, fuelling an unspoken frenzy amongst 1800 souls that he might dare to play a couple of (whisper it) Jam songs. He did. A punchy, punky Start! received almost the biggest cheer of the night, and even the inability of Weller to hit the high notes of his youth couldn’t dampen things. I don’t know what Weller thinks of this – he’s clearly comfortable playing these old songs that mean so much to so many, but his own, more recent back catalogue is sounding sensational in its current form – Dragonfly, Andromeda, Sea Spray, Wake Up The Nation, Come On Let’s Go, 7&3 Is The Striker’s Name. They are equally as deserving of that same roof-raising cheer – a roof-raising cheer that reached delirious levels of excitement when the group walked out for the second encore and the bass player thudded into the opening Motownisms of A Town Called Malice. 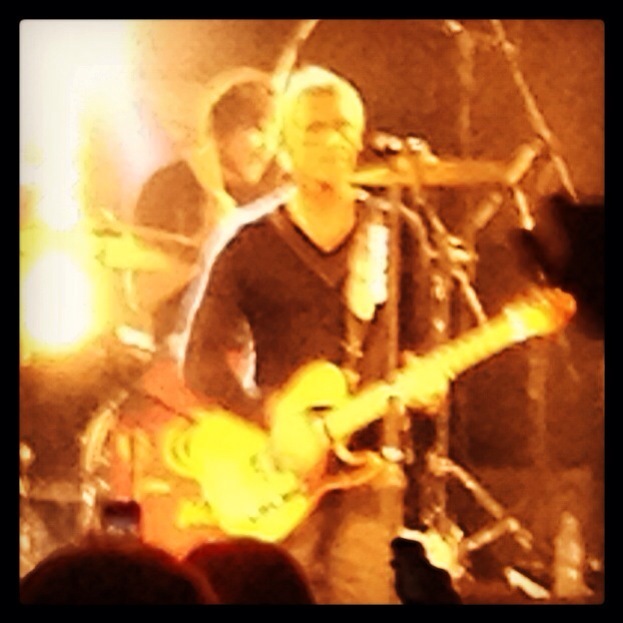 Weller, on joint tambourine and Telecaster duties looked like the happiest man on the planet. And given that 1800 people had just spontaneously combusted in total delight, that’s really saying something. Disappointments? None really. 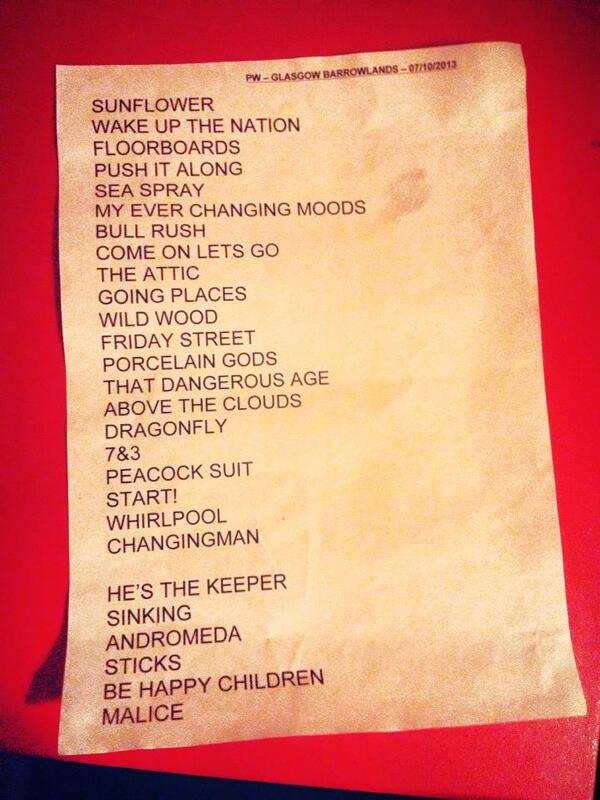 The above set list shows He’s The Keeper and Out Of The Sinking, neither of which he played, for whatever reason. I did think, early on, when it was clear he was here to entertain, that we might get Into Tomorrow. But no. And it’s possible to create your own brilliant set from the obvious tracks he didn’t play – Brushed would’ve sounded great in this set for example (as would Out Of The Sinking for that matter), and I’d have liked to hear Starlite, the forgotten single released between the last two LPs, but really, you can’t complain. A just-short-of two hours set with tracks from all eras fizzing off the stage like welders’ sparks is a good night out, is it not? This is, I’m certain, the most fired-up and relevant Weller I’ve ever seen in concert. If you have a ticket for one of the shows, you’re going to really enjoy it. If you don’t have one, do everything you can to get one. 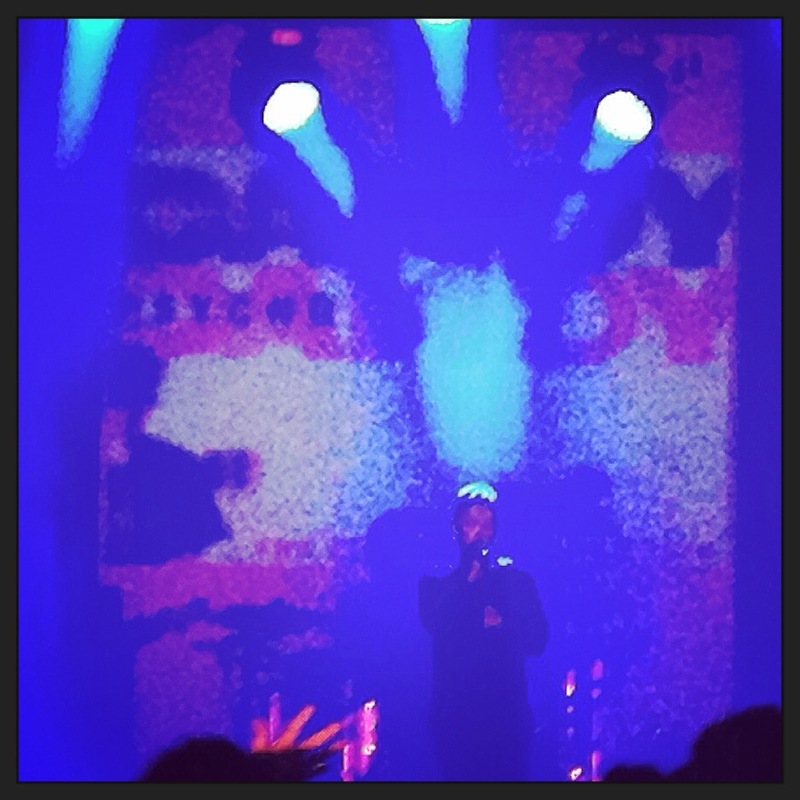 My ears are still ringing, by the way…..
Cover Versions, Gone but not forgotten, Live! The Great Pyramid of Giza. The Hanging Gardens of Babylon. The Statue of Zeus at Olympia. The Temple of Artemis at Ephesus. The Mausoleum at Halicarnassus. The Colossus of Rhodes. The Lighthouse of Alexandria. The Seven Wonders of the World. You’d think that by now, the 21st Century, someone somewhere might fancy updating that list. 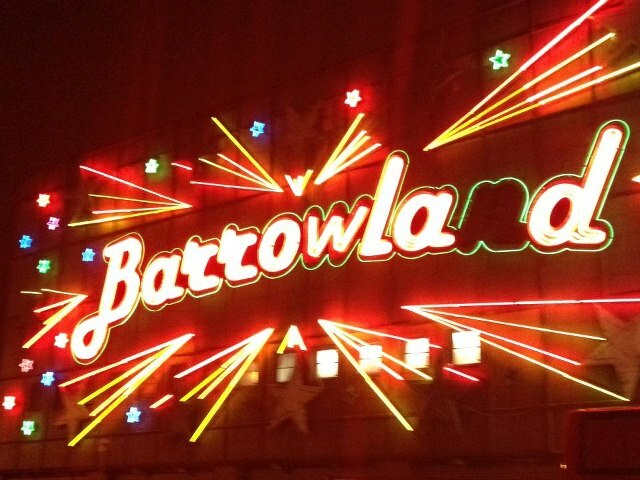 I think I missed the appeal when they were asking folk to write in with their suggestions for the 8th wonder, but if it’s not too late, I’m putting forward the Glasgow Barrowlands for inclusion. 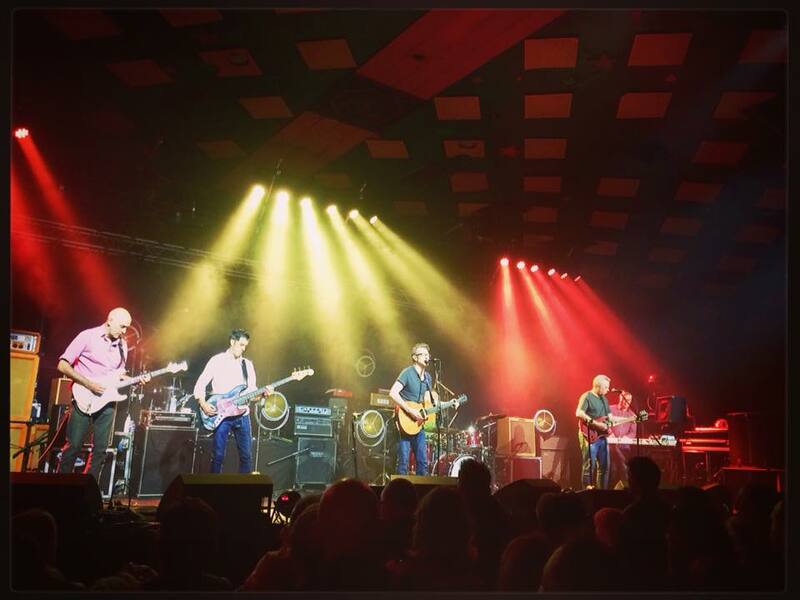 To be more specific, I’m putting forward the Barrowlands when it’s packed-to-the-gunnels full and the band on stage is on fire. I’ve been to the Barras plenty of times. It’s always good. Often, it’s great. Other times, it’s really great. Last night, the second night of The Specials double header, it was electric; right there and then the best place to be on the entire planet. It was packed-to-the-gunnels full. The band was on fire. You didn’t want it to end. A greatest hits and more was played out to a mongrel swill of a crowd; from old suedeheads in too-tight Fred Perrys and braces, spit-shiny Docs and straining-at-the-waist Levis, to ageing mohican’d punks and punkettes, to 40-something numpties in pork pie hats, the weekend rude boys who really should know better, the same guys who take their tops off and still chant “We are the mods!” at Who gigs, to the young team in misguided Liam Gallagher feathercuts and Superdry mod parkas. Punks, teds, natty dreads, mods, rockers, hippies and skinheads, as Do The Dog says, all united on the famous sprung dancefloor that, to paraphrase that Scandinavian football commentator from way back when The Specials first mattered, took one hell of a beating. It’s life-affirming when you realise at the age of 43 you still want to get involved at a gig, that you’re not content standing at the side debating the merits of the setlist with yourself, but you’d rather go for it, jump right in and get into it. I lost a stone and a half in the first 20 minutes alone. My polo shirt stank of other people’s beer on the way home. As I type, I’m looking at my battered desert boots, who look like they’ve been in the trenches at the Somme. The opening four numbers came at you like a breathless, skanking Ramones – Bam! Bam! Bam! Bam! I can’t be certain what was played, or in what order (it might’ve been Do The Dog and Concrete Jungle and Rat Race and Gangsters). One into another, a storm of ricocheting pistol cracks from the snare and Roddy Radiation’s spaghetti western twang, glued together by the Hall hangdog vocal. Then the brass section came on. Then the strings. And the band cherry-picked their way through a back catalogue rich in dubby textures and exotica flourishes. Pinch yourself for a minute. That’s The Specials! Playing International Jet Set! I took a particular shine to the three pouting string players, bobbing their heads from side to side in perfect unison whenever the dub swelled and the need for strings reduced. Picture courtesy of Cameron Mackenzie. Cheers! This clearly isn’t some half-arsed in-it-for-the-money Stones tour. This is a band playing better than ever to an audience somewhat largely made up of people too young to have seen them first time around (I was 10 when I bought Do Nothing for 99p with my £1 pocket money). The Specials are on fire right now and demand your attention. We were lucky enough to get an extra, unplanned encore, a Terry-free Guns Of Navarone, played by a band who’d wandered on after the outro music had begun and some of the audience had filtered off towards the exits and Central Station. Nae luck, non-believers. There’s no youth culture anymore. Cast your eye over the appearance of any youngster and you wouldn’t know if they were into Pink or Pink Floyd. Last night showed why tribal music matters. 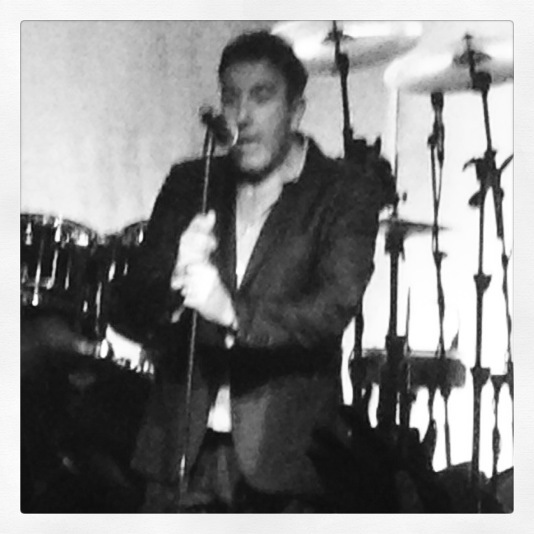 If you do one thing this year, go and see The Specials.